1. The thermistor is now mounted on a copper tag for easy removal. 2. The dome nut nozzle has been reshaped to a thinner point. 3. No insulation - it just absorbs plastic. 4. Heavy copper wires crimped to the nichrome heating coil. 5. Actually did wrap both ends of barrel in PTFE before assembly this time. 6. When drilling barrel using drill press, drill in half way from each end to keep hole central. The first one I built had a pinhole leak in the barrel where my lousy drilling clipped the thread. I discover this after assembly. Moral: Check for leaks. During testing I blew up 3 PICs. Moral: Insulate your thermistor leads well. I also discovered that thermistors with a very low (<500 ohms) resistance at operating temperature spook the PIC's temperature measurement causing the heater to operate intermittently. If you've got one of these, stick a 560 ohm resistor in series with it and all should be well. You'll have to recalibrate of course. Moral: Try to use stock parts. And now, she works again. I have now imported Andreas's improvements and corrections to the PIC firmware into Simon's experimental autoconf version of the code for the PIC16F648A. It all compiles, and - when put in a RepRap machine - works (at least it did for me...). We need to do a bit more testing. Then if this all pans out OK this'll become the Subversion trunk version and we'll do a release. The compiled .hex files (remember they're for a PIC16F648 or PIC16F648A, not a PIC16F628) can be downloaded from here. 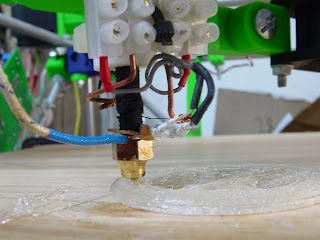 Unless you have more than one extruder on your RepRap, you can ignore the file extruder_1_.hex. in stepmotor2.c and increasing TESTLEN until the linker barfs I deduce that we have a whole 53 extra bytes to play with in the stepper code now! Recently, a cool dude by the name of Scott McClure emailed me about locating a supplier for machined parts. He mentioned a site called emachineshop.com which is really awesome. They have a free CAD application you can use to design parts to be made, get quotes, and order parts, all within the same application. I had heard of them before, but I didn't have a ton of experience with CAD so I didn't follow up. Anyway, Scott suggested that we use them to get the machined parts we need for the extruder. Not only that, but he went above and beyond and made drawings up of the parts we need! He emailed me those files to look at, and hopefully have parts made from eventually. The prices are reasonable at the quantities we're looking at, and the work that Scott did was very good. Here's the situation: it does not make sense to do a test order of a small number of parts, so we pretty much have to do a production size order. Obviously this runs the risk of getting 100 parts that are not what we need or want! I trust that the drawings Scott did are correct, but in the interest of perfection I present the files to you, the community to help spot any potential mistakes. Many eyes make bugs shallow, right? extruder drive screw - this is one piece with an extra 10mm of drilled shaft that is intended to be cut off by the end user to make the nut assembly to solder to the motor end of the braided wire. half bearing - these are the bearings for the extruder drive screw. 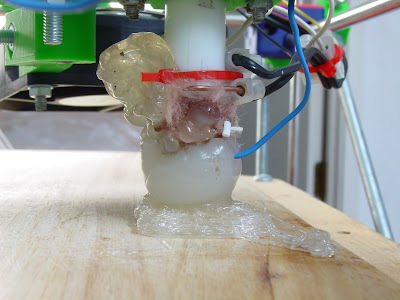 Millions of years ago, this prehistoric RepRap print head stumbled into a freshly emerging stream of molten PLA. It became trapped, the PLA smothered it, and it became completely encapsulated. Now this specimen is perfectly preserved, and industrial archaeologists can observe its primitive construction in minute detail. 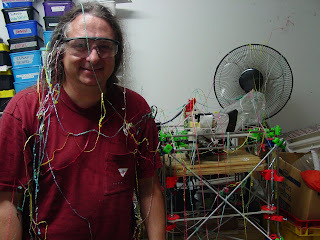 It may even be possible to extract early RepRap developer DNA. This is going to be a complete bugger to chip free. I'll probably bake it at 150C for a while and pull all the crud off. The cable tie and terminal block will melt, of course. At least there is a thermocouple conveniently embedded in the blob. The girls, however, want me to preserve it as a memento so I may have to build a new one. How the heck? I left the thing running overnight doing an X Axis Constraint and a serial error caused it to stall with the extruder motor and heater running. The nozzle oozes a bit for a few seconds after the extruder motor's been shut off. Naturally the dribble spoils the build a bit, so I thought I'd try building in a wiper to clean its noze before each layer. The framework comes off the diagonal, and looks a bit like an intergalactic spaceweapon. Things under test so far are razor blades and car windscreen wipers. I've corrected the PIC firmware so that it now correctly does half-stepping. It's checked back into the Sourceforge repository in Subversion. This means that we can definitely use the cheaper 200-steps-per-rev stepper motors. You need a bipolar one where the coils can take a voltage of 12v and each use a current of 2A or less. Details on the forums here. Not a bad weekend, actually. Participated into a project to build an impressive electric racing car (the Saker EV) in NZ, which meant attending a conference in Taupo for a couple of days. So, not much reprapping done, but I have at oh-dark-hundred managed to get the thing going like it was before I messed with it. I just changed too much at once without proving my new extruder barrel first. 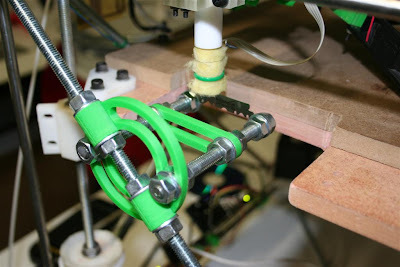 Hope to print a V1.1 and restart the changes more slowly by sticking in just the new X axis PIC. 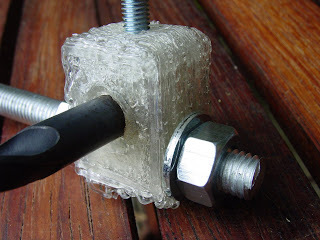 The RRRF is looking for someone to make certain metal parts for the Extruder Kit. If you are that someone, you know that someone, or you're interested in submitting quotes to companies, please read the post and get back to me. Ideally this will be someone in the USA because shipping costs make it impractical for the small number of items I need.